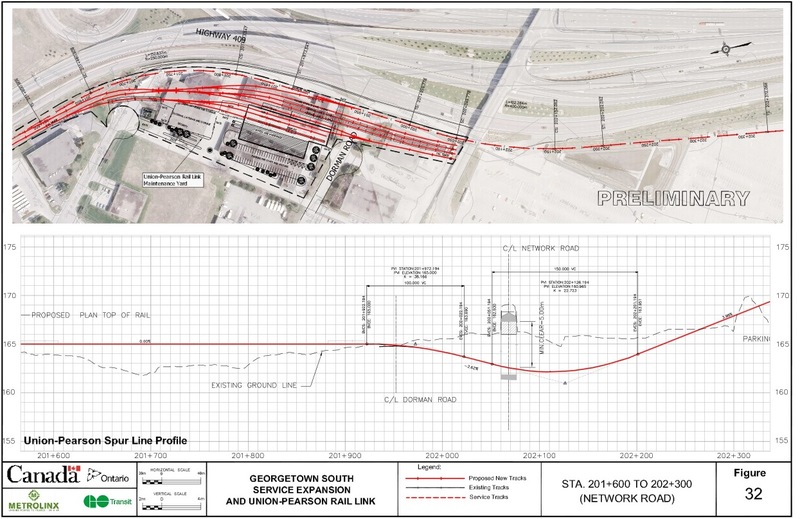 Documents related to the Crosstown’s original design can be found on the project’s website in a page dedicated to the Environmental Project Report. The file of interest is in Chapter 3, Plates, Part 1 which gives details from the airport east to roughly the Allen Expressway. The portion of interest here is from plate 27 to plate 34 covering the Humber River east to Black Creek. Illustrations here are reduced from their size and level of detail in the linked reports. 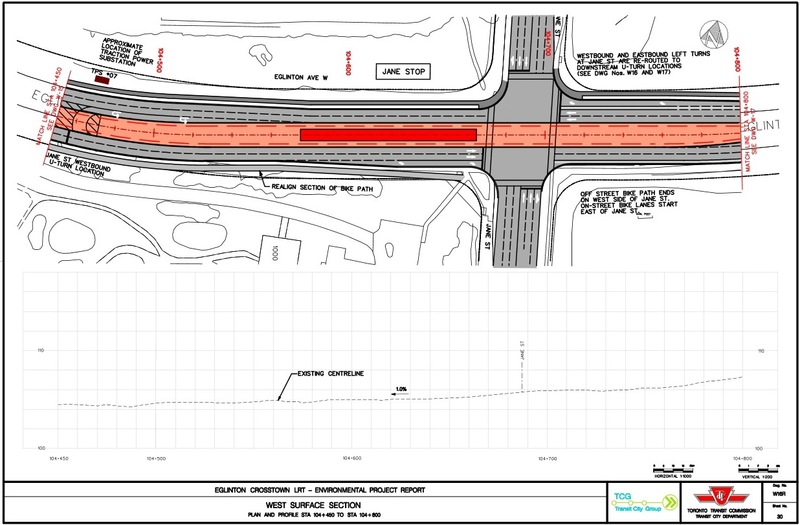 In the original scheme, the LRT line was to stay in the middle of the street all the way from the portal east of Black Creek, under the rail corridor, through the intersection at Weston Road, down the hill to Jane Street and points west. The difference in elevation is substantial with a 4.9% grade down into the valley (see the vertical profile at the bottom of plate 31). 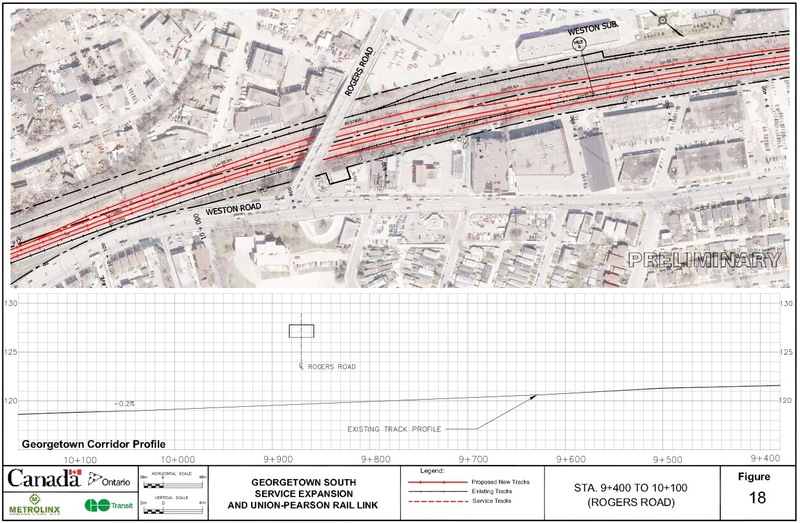 This is almost double the maximum gradient for any conventional GO equipment, although there is a comparable grade on the spur line from the rail corridor into the airport (see discussion of the Georgetown corridor later in the article). 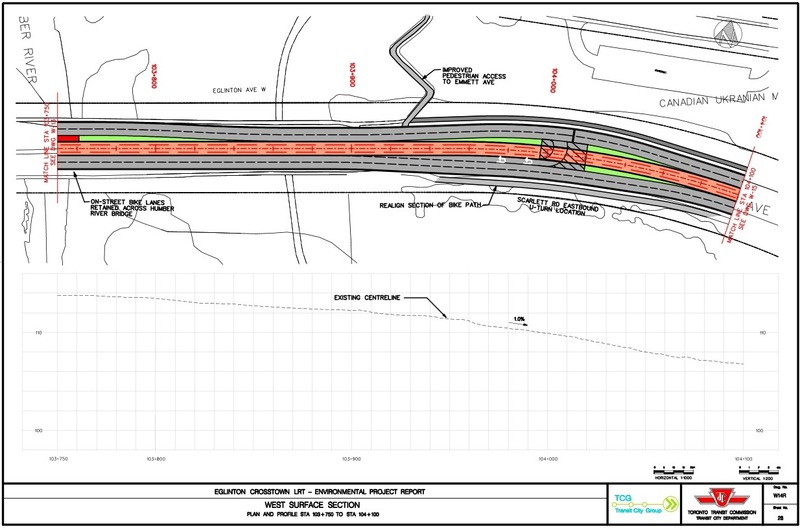 Correction: In the original design of the airport spur, there was a steep grade required to drop the line to a level appropriate for access to a maintenance facility. Because this has been moved to another location, the steep grades on the airport spur were removed, and it now is built to a maximum 2% grade, the standard for GO’s passenger operations. This defines the type of equipment that must operate on SmartTrack, and it would almost certainly be trains of Electric Multiple Units (EMUs), not full-sized GO trains as has been claimed on occasion. 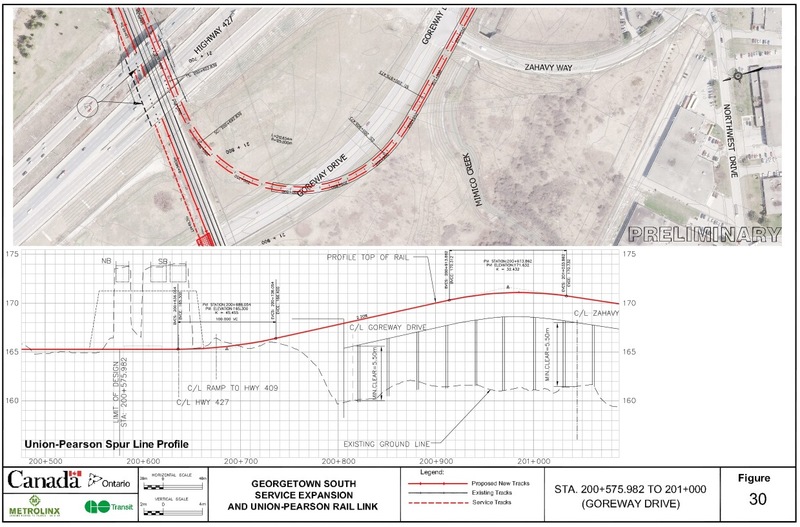 If something less able to handle this grade is intended, then the path from the rail corridor down to Jane Street must take a longer descent, and this affects issues such as station placement and the location of a curve between the rail line and Eglinton itself. Plate 32 shows the original scheme for Mt. Dennis Station with a centre platform on the street west of Weston Road. This would have included not only the extra width for the platform, but for a storage track west of the station. All of this would not fit in the existing roadway. Houses built to the sidewalk line on the north side of Eglinton would have to be demolished, a scheme that did not endear the original LRT proposal to the Mt. Dennis citizens. The TTC and Metrolinx were quite adamant through the project’s review that no alternative was possible, although what was really going on was that Queen’s Park refused to up the ante on project funding. Various alternatives were studied (see Appendix K), and of interest in today’s context were the difficulties with underground structures at or near Mt. Dennis Station. (See Appendixes A/B to Appendix K.) A common problem was that the station structure and/or a three-track section for turnbacks affected properties above the line on both the east and west sides of Weston Road, including the houses mentioned above. The at grade scheme didn’t get very far, and continued political pressure forced Metrolinx to reconsider its options. In an addendum, a completely revised setup for Mt. Dennis Station became the preferred option. For details of the alignment see Plates E-3a to E-3g of the Executive Summary PDF. This scheme shifts the platform east under the rail corridor and avoids the requirement for a wider structure west of the station. 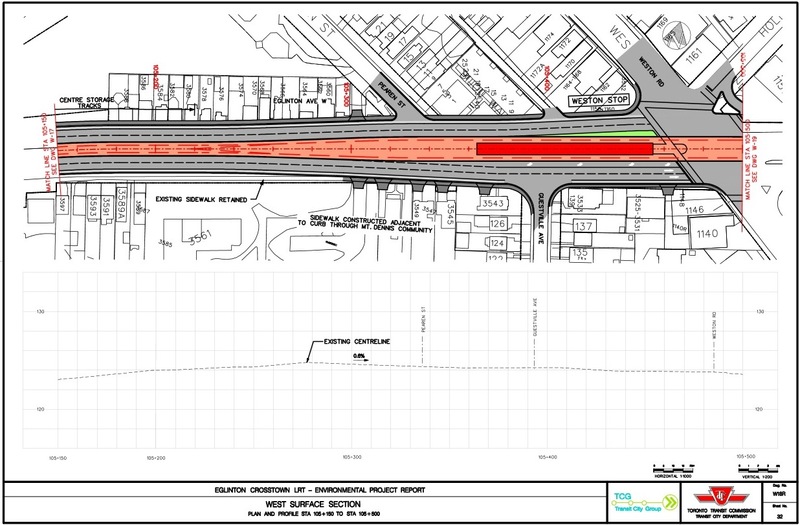 The grade for a future extension westward is less onerous because the line is already underground at Weston Road and does not have to descend as far to reach the level of Jane Street. However, this is still a higher elevation than SmartTrack would use because it would tunnel under Jane and under the Humber River further west. The design of this station and alignment was a hard-fought battle in Mt. Dennis, and it cannot be wished away by treating objections to construction hurdles as simple problems to be overcome. This is a neighbourhood already sensitized to the tender mercies of planners who don’t care about local effects. Now let us look at the rail corridor. 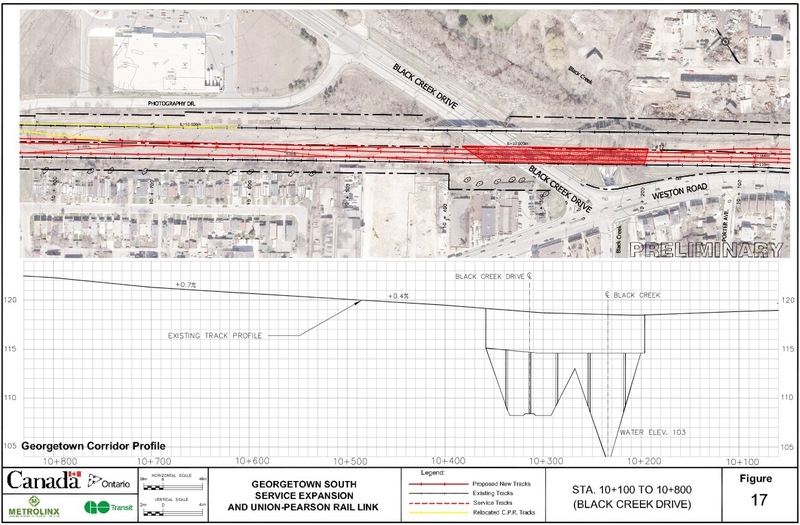 Like the Eglinton line, the Georgetown South project encountered stiff community opposition because of effects along the rail corridor. 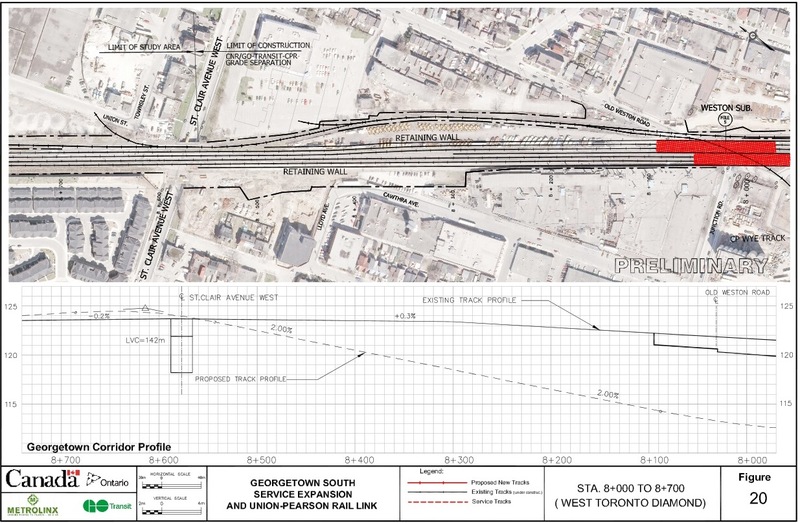 This has required GO/Metrolinx to completely rethink the section around Weston Station north of Lawrence Avenue West and to provide more grade separation than originally planned. 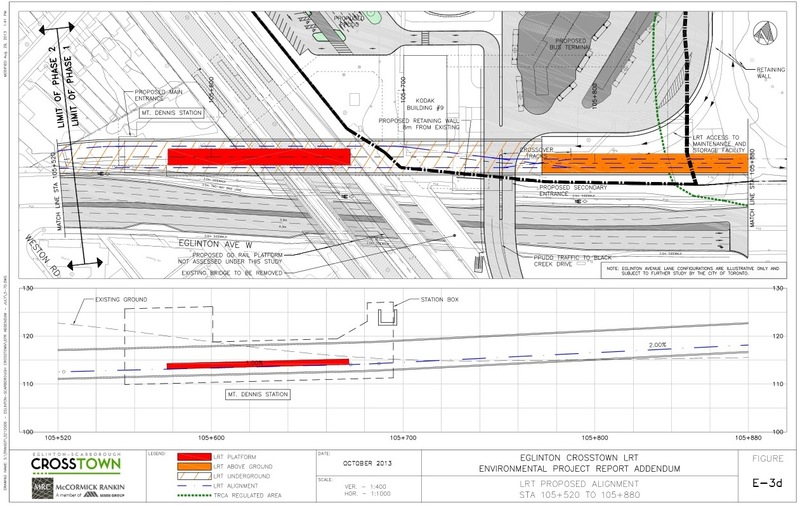 Further south, there is provision for a future interchange with the Eglinton Crosstown line whose station (see above) is now directly under the rail corridor. 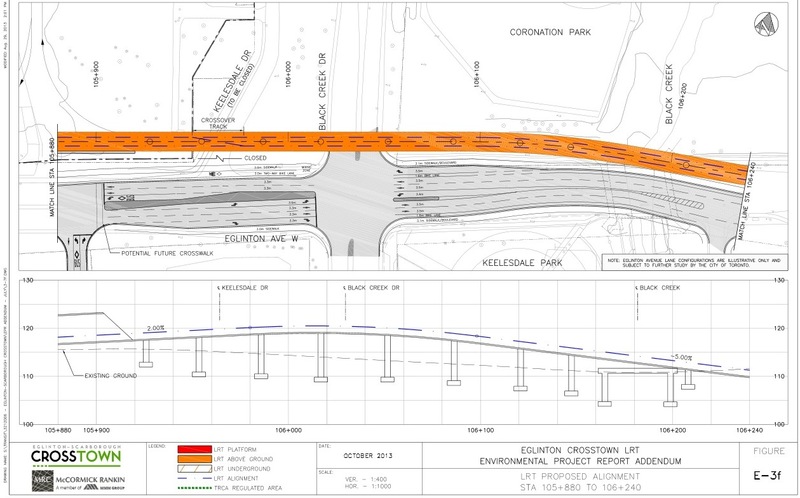 This project produced its own Environmental Report complete with drawings in Appendix I. Plates 16 to 20 cover the section from Eglinton south to St. Clair. Under Eglinton Avenue west of Weston Road. This location is the easiest to fit in, but it brings up again the issue of the effect on buildings above the station structure just as the proposed Mt. Dennis Station on the LRT line did. On the rail corridor south of Eglinton before the turn west. This location is constrained by the presence of Black Creek drive (not to mention Black Creek itself) not far south of Eglinton. The station would have to be underground so that the turn under the residential community could be executed underneath it as a bored tunnel rather than by cut-and-cover construction. In turn, that would require the SmartTrack line to begin dropping into its tunnel further south somewhere between St. Clair and Black Creek. This location would certainly not be an easy one to build in, and the station would not be close by the LRT (or a future GO Eglinton West station). On the curve between the rail corridor and Eglinton. For this to work, the curve would have to be in two segments so that the station itself could occupy a straight section of track. This is essential for alignment between the platform and the car doorways. Whether this is physically possible is dubious, and depends on the minimum curve radius that equipment operating on this line could handle and the maximum length of the trains. The station itself would be under the residential neighbourhood, an obviously unworkable location. In summary, any tunnel at Mt. 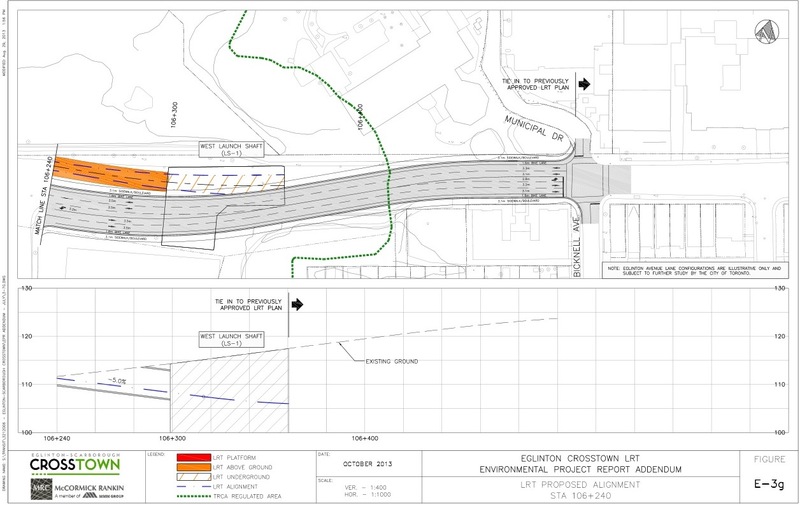 Dennis must quickly drop from the rail corridor’s elevation to get under the residential community southeast of Eglinton/Weston, pause in its descent and curvature for a station (whose size is in turn dictated by the type of equipment that might be operated), and then resume dropping both to get under Jane Street and, further west, the Humber River. 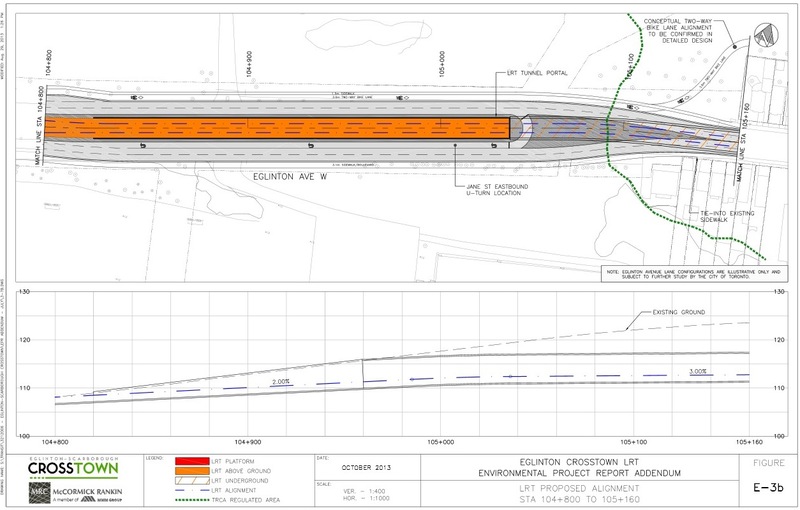 This material is included here for reference although it is not part of SmartTrack per se. 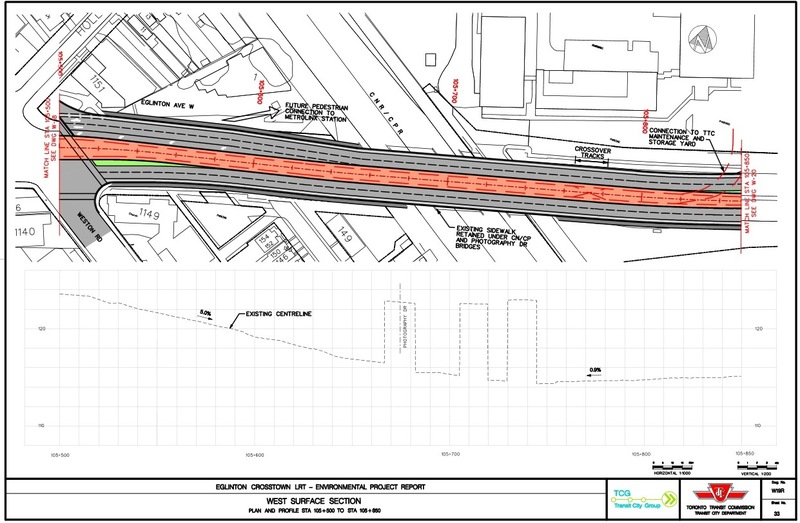 Here are the alignment drawings for the route from the Weston corridor south to the airport. The curve radius of 125m for the turn from the main rail corridor into the spur. The grades of almost 4%. The length of the station at the airport (less than 100m). All of these dictate that something other than conventional GO trains serve this spur. The platform size places an upper bound on the capacity of any train serving this location. 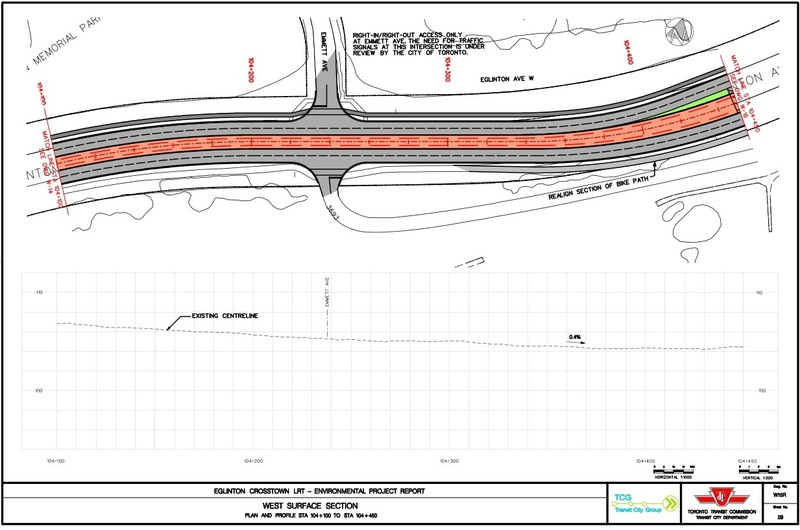 Correction: Karl Junkin has pointed out to me that the design actually under construction is not the same as the one shown in the Georgetown South EA, and that there is a video giving an animated tour of the new alignment. 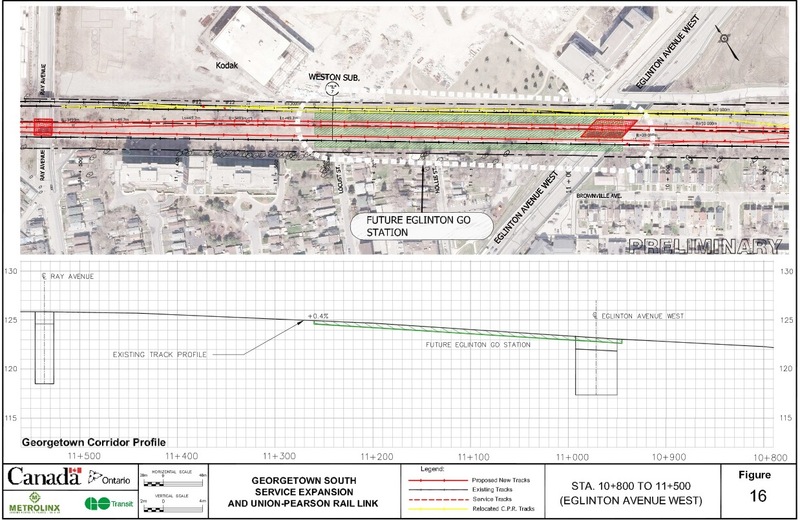 The 4% grades originally planned are no longer necessary because a descent to a proposed maintenance yard has been eliminated thanks to relocation of the yard. Notwithstanding this change, the spur could not accommodate regular sized GO equipment. The RER belongs in the rail corridor at least as far as Brampton if not beyond, and the airport will always be a low-volume spur operation. Taking the RER west along Eglinton is a foolish modification to an otherwise defensible plan. 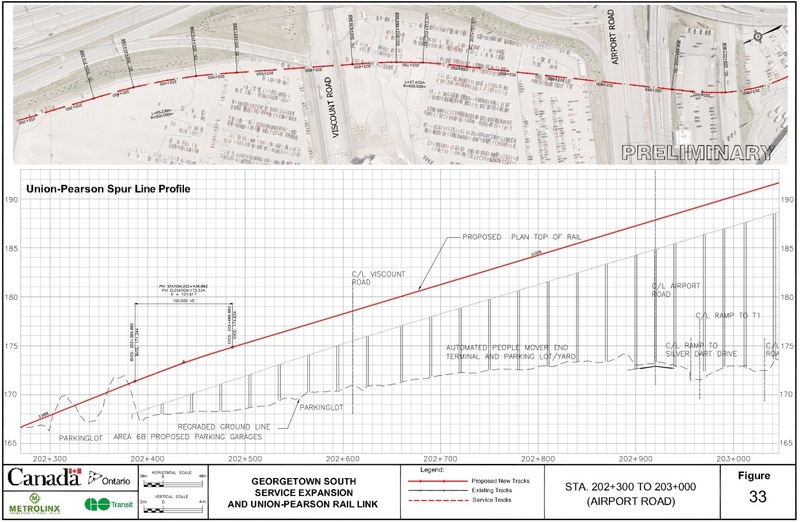 In February 2010, at the time of filing of the Statement of Completion of the Environmental Project Report (EPR) for the Georgetown South Service Expansion and Union-Pearson Rail Link, the Union-Pearson Airlink Group was responsible for the design, construction and operation of the Union-Pearson Rail Link Service (now known as UP Express). 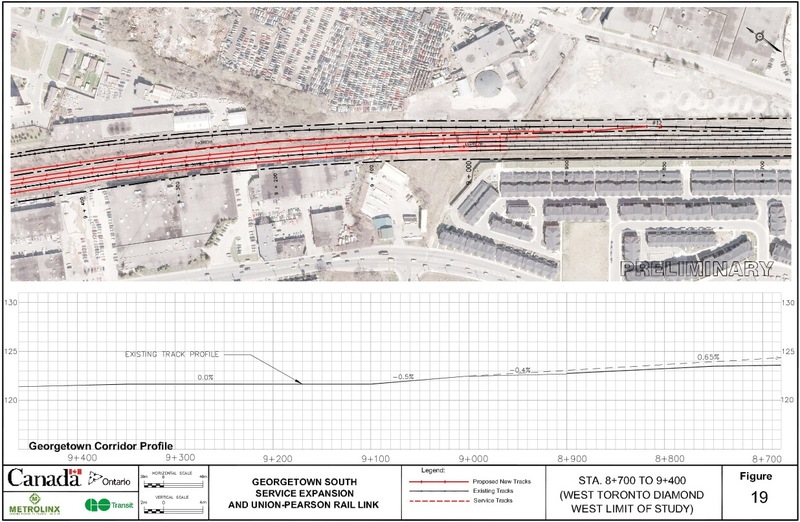 When the responsibility of the design, construction and operation of the UP Express was assigned to Metrolinx following the EA, a review of the project, including the vertical and horizontal alignment of the Spur Line, was completed to identify improvements to the design. 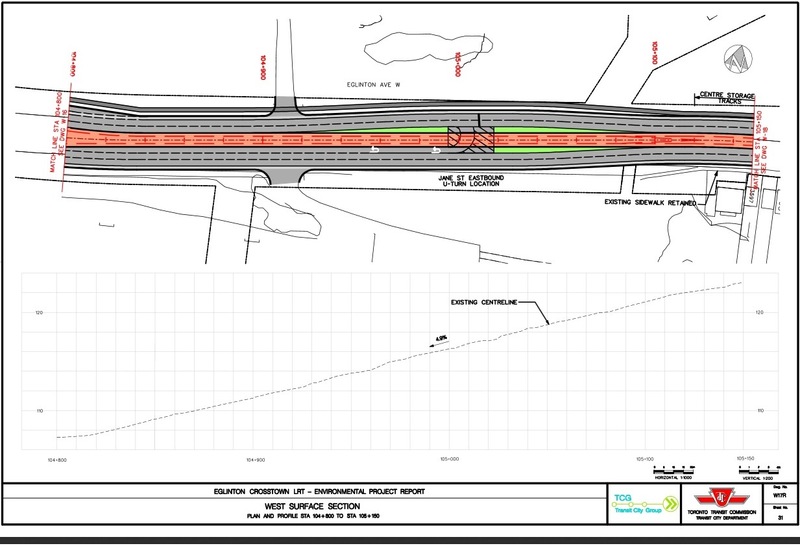 The potential for changes during the detailed design phase of a project, following approval of the EPR, is anticipated during the Transit Project Assessment Project process. 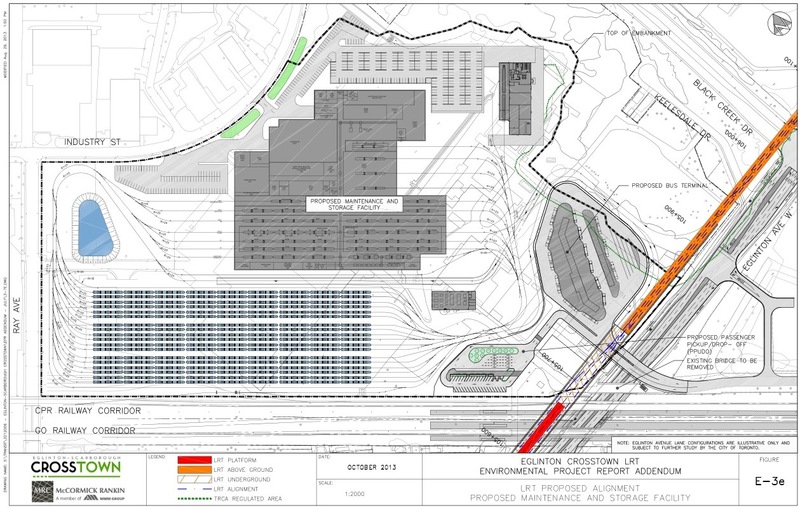 During the detailed design phase, Metrolinx determined that maintenance and other activities contemplated at the Operations Management Centre (OMC), proposed in the EPR at a location along the spur, could be accommodated elsewhere within the Metrolinx – GO Transit rail network. Environmental impacts associated with construction and operation of this facility were then avoided. In addition, the decision not to design and construct the OMC also provided an opportunity to reassess the vertical profile of the approved project, as the need to return to grade to access the OMC was no longer under consideration. 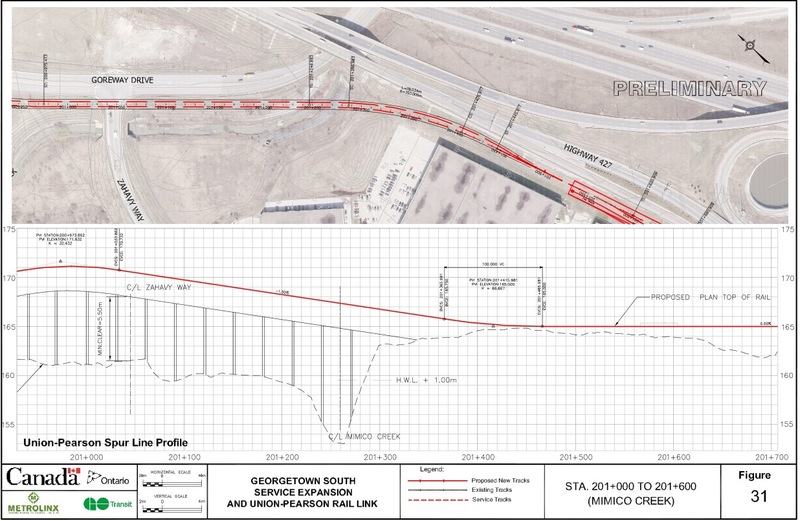 Under the original project, the transition grade from the OMC towards the Terminal Station was projected to be 3.98 percent, significantly steep for rail operations. 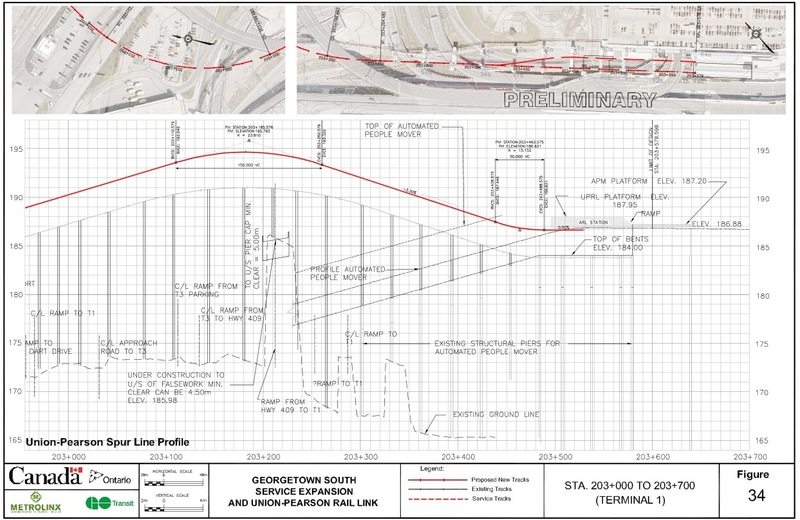 The re-alignment of the vertical profile of the Spur Line reduced this grade to approximately 2.00 percent, and resulted in two fewer grade transitions along the Spur Line. This grade reduction will significantly improve the operation of the UP Express service with respect to safety and energy efficiency, as well as the level of customer comfort along this portion of the route . 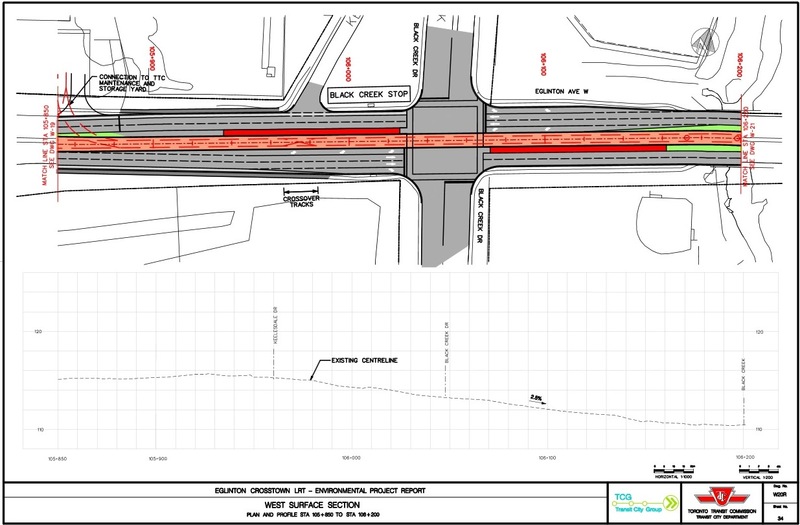 The resulting cost savings enabled double-tracking of the spur which also improves safety and reliability. The environmental impacts of this change in vertical alignment were determined to be negligible. 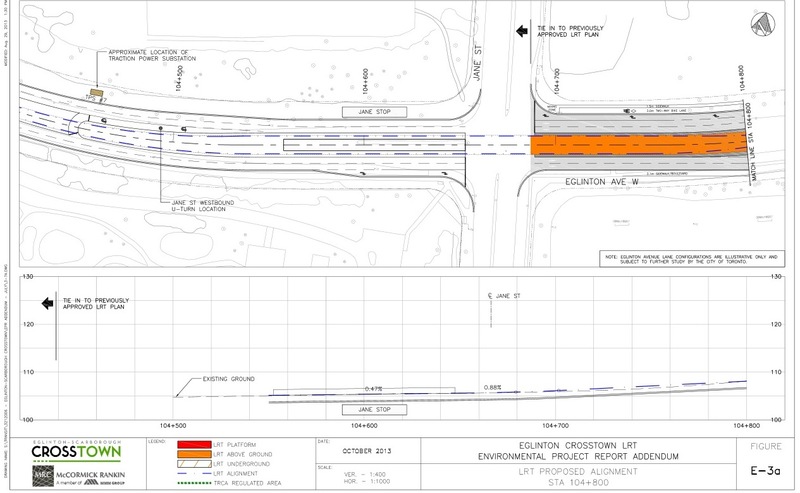 Here is a drawing comparing the original and revised alignments (the resolution is that provided by Metrolinx). It is unclear whether SmartTrack is really a “new” service at all or simply a rebranding of something Metrolinx was planning to do all along. As such, SmartTrack cannot make up its mind whether to be a local or a regional service, and attempts to serve two purposes in one facility. SmartTrack started out as an all-surface proposal, but eventually gained an underground component once the difficulties of the alignment from Mt. Dennis westward became apparent. If the line had stayed in the rail corridor, this would not have been an issue. Fixing this requires more than a wave of the hand dismissing objections as negative thinking. We already know that Tory’s “experts” depended on out-of-date Google Street View images of Eglinton where recent developments built in the former Richview Expressway lands were not visible. Have they looked at the terrain, or the relationship between various streets and rail corridors as shown in the drawings included here (all easily found in the public domain)? One might wonder. There is nothing wrong with supporting expansion of regional rail services to provide added capacity into the core area and even to support counter-peak commuting where the rail services actually connect with job centres in the 905, but this has to be done in a realistic manner. Raising challenges to SmartTrack does not mean that I or anyone else of like mind is opposed to the RER scheme. Indeed, I support it quite strongly and don’t want to see Try distort the rollout plan to suit his own pet project. Even worse, I don’t want the provincial government (which does not have any by-elections requiring voter bribery in the near future) to screw up RER either. If John Tory becomes mayor, he will need to learn flexibility, to learn that his precious plan can and should be modified, and that it is not the answer to every problem afflicting southern Ontario. That would be the collegial John Tory many hope to see after the election. If only his campaign sounded as if that’s what he’s selling Toronto. This entry was posted in A Grand Plan, Eglinton LRT, Elections, GO Transit, SmartTrack, Transit. Bookmark the permalink. If it were up to me, I’d install a Spadina-style streetcar service with dedicated lanes on Yonge. It would take all the local traffic off the subway by using the surface space more efficiently. We’d have to think about how to tell the Fords — maybe make them sit down and take some anti-anxiety medication first — as I wouldn’t want to be responsible for causing a heart attack when they found out a streetcar ROW is to be installed right where they thought transit was permanently banished to the underground. One of the things that I think is frequently forgotten in the entire debate about subway, in RT, is just how small a fleet of cars, and how little capacity is actually in question with regards to replacing. As Steve noted it would take about 60 Artic buses. However, some of that is based on a longer trip. I believe less than 30 RT cars are in operation, and they are about half the size of the LRT cars that would replace them. Peak operations of 4000 riders, headway is on the order or 4-5 minutes, and we need a subway to replace it? Sure it is overloaded, but really? Steve: The SRT fleet is 28 cars. A single car LRT every 2 minutes would replace the RT capacity. I think that it should be designed and built around supporting 4 cars, and started with 2 at a 2 minute headway at peak. However, add a 10-15 minute headway Regional Express Rail to downtown only 2 km away (and on the LRT), and you have to ask questions about subway. The main transfer free (single seat ride) connection to the core would be in Stouffville and would go no transfers. Even the subway extension would have a transfer. LRT to RER would be a single transfer ride to the core, meaning exactly the same number as Danforth to Yonge, with shorter bus rides. Steve: Any replacement service should more than replace existing capacity as there is a backlog of unmet demand. 8K is certainly where we need to aim for starters. Support an underground station at Union, or ensure there is multi platform/track support at Union, and I suspect you could get that down to well under 10 minute headway. Having both a subway extension, and small headway RER, is beyond wasteful, and does not buy real service for Scarborough, only very large capital and operating expenses. Small headway RER has the massive advantage of going around Yonge/Bloor for those who are core bound. The notion that Tory supports both subway and SmartTracks in this area means that his position is pure pandering, and not based on any real transit planning. I do not believe I have seen any demand model that would see enough demand to support both services and increased frequency in Lakeshore anytime in the reasonable future. Yes, Scarborough needs transit as does Rexdale. Please do not promise pie in the sky, but a buildable plan that meets demand, and then futher intensification. Improve the system that collects people across Scarborough, and delivers them to their actual destination. Look at what system would actually increase the useability of transit and increase ridership. Yes deliver current riders, but look at the actual scale required to do so, and include the idea of attracting new riders. I think the real issue is that the RT was not the right solution to begin with, it was poorly implemented, and then left to fester far too long, and never had real capacity added. Now Scarborough along with the rest of the city, needs transit, and needs it now. The LRT needs to be fast, expandable, easy to transfer off of, offer a riders a choice of GO RER, Eglinton LRT and Danforth subway, and needs to make sure that if can be expanded hugely beyond any reasonably foreseable demand. Make sure it can support 4 car LRT trains every 90 seconds, and the transfer to subway is step off, step on. PS: Piece from R. Michael Warren in the Star from last year. I think it applies doubly when you look at the addition of SmartTracks in the middle of an election to the same area . SmartTrack, Regional Express Rail, DRL, etc will take many years to build and we need relief now and so we need to increase bus (preferably clean 100% electric buses) and streetcar service NOW. Also Ossington buses are too full during rush hours and so we need to either use articulated buses or streetcars on that route so can have some breathing room. I think that the only way to muddle through the next few years is to have a real plan and not a platform. This plan needs to include immediate, short, medium and long term components, that can adapt to the reality that is on the ground, and the one we should reasonably expect coming. It also needs funding for each portion of the plan. I am not convinced (either way) that Ossington makes sense for Artic buses, does it not have an inordinately high frequency of stops? It may be worthy of a study, but certainly an increased bus service would be a start. A plan means looking at actual ridership, and origin and destination information, and starting to build a network accordingly. It means addressing how transit moves through the city, and looking at surface transit, and required fixes (transit priority, dedicated ROW, parking, lane restriction and by-law enforcement, other traffic management) . It also means leaving room for future adaptation of that network and a little spare capacity on subways, and in major corridors and terminus points to allow the network to be tweaked and service adjusted. One of my concerns with SmartTrack is that it does not appear to allow enough room in Lakeshore or at Union to provide for other services that we either know about needs now (outer 416 on Lakeshore) or to provide other service. It also does not really discuss how the people get to and from this service, or to what degree it will change ridership patterns. A transit plan needs to allow for what may be coming, and how to manage it. What would a 60% transit share look like in Scarborough, or Rexdale? What does a GTA of 8-9 million and a city of Toronto of 4 million look like? What about if it is virtually all contained inside the greenbelt? Sixty (60) extra buses will not do anything, and in many ways this proposal is a joke. Tokyo to name a few. Just copy the best solutions that would fit into Toronto. There is no need to invent the wheel or “preserve pride of authorship”. Some sacred cows have to be , well ….. , you know what I mean. Is John Tory looking for only a single term as mayor? If not, then it would be prudent for him to move ASAP with the already approved Scarborough subway. The point that the 60 extra buses are meant to act as a stop gap, and what would be required to replace the current capacity of the RT. LRT, RER, BRT, the basic ideas are not new, or unique to Toronto. Toronto seems stuck on Subway as the only one. It insists on sticking with only what we already have seen in Toronto. Munich has regional express rail, as part of its transit solution. It also has an extensive Tram network. The coordination of such networks allows for a far vaster high quality transit to be spread across the city. The idea that subway is the only solution, or that electrified regional express rail is a new idea is wrong. The real questions if we are to use the models elsewhere to help guide our transit development, what technologies, that we have yet to employ here should we implement, and what worked and will work under what circumstances. The issue in Toronto has been the insistence on continuing with subway only. Toronto, needs to start to emulate best practice elsewhere. It also needs to be aware of the idea that a network needs to be extensive and reliable and quick in order to get a high transit split. The question with buses is whether if they were bought to support a given project whether they would find immediate use afterwards, and I believe the answer is yes. Personally I think Regional Express Rail, and LRT should both be pursued through this area. The LRT should link up with the Crosstown, the subway, and RER. The other LRT projects should also be pursued, and Toronto can reasonably afford to operate both. I would also like to see an honest costing of what it would take to convert the existing short portion of subway on Sheppard to LRT. Let us look at other networks, amen. Please see very extensive and functional Munich Tram network. Please see Munich tram in middle of street ROW. One of the questions with subway that must be addressed is where are people going, and is subway really the most appropriate way of getting them there. Also what other needs are there in the area, and what else is required to serve them. RER is better for a direct to core rider, now what about the rest of the ridership? Oh, and yes Munich also has an extensive RER network. Amen, let us look elsewhere. Subway giving way to a number of lower capacity lines in lower density areas is the norm. 26 hours until this election is over. I look forward to see how SmartTrack will work. No offence but don’t they have elections or any election issues in Oakville? Let Torontonians worry about Toronto issues and Toronto election. SmartTrack will work just fine and will also serve as the much needed Downtown Relief Line. Steve: SmartTrack will provide some relief, but it has been much oversold, and the actual relief subway line, including its northern extension to Don Mills, will be needed eventually. What is quite frustrating in all of this is that we are tossing around billions of dollars when studies about alternatives and their benefits are still underway. Metrolinx is looking at RER (which is precisely what ST is, except for its Eglinton West branch, and there is a study between them and the City re alternative schemes for a “DRL”. Metrolinx’ own studies show that a DRL will be needed, and it is foolish of John Tory to give the impression that somehow we can ignore this. I fully agree after all, Olivia Chow lost this election in Scarborough due to her very vocal opposition to the already approved Scarborough subway. Olivia Chow instead promised only a 10% dirty diesel bus service increase for Scarborough and that too during rush hours only and an LRT that nobody in Scarborough wants and the only people who seem to want it are the Downtowners who will never ride it. Olivia Chow lamented how the Scarborough subway will cost a 30 yr tax increase but why did she fail to mention how much tax increase a much more expensive DRL will cause? A Scarborough subway might cause a nominal tax increase for 30 yrs but a DRL, which is much more expensive, will cause a much higher tax increase for much longer. Olivia Chow will be lucky to get 5% of the votes in Toronto’s largest borough – Scarborough. As is clear from this site, Downtowners still can’t accept a Scarborough subway and still keep debating among themselves as to how many buses, etc can be used instead of the Scarborough subway. What I tell them is this: the Scarborough subway has already been approved, all of the Scarborough MPPs (all Liberals) as well as the new mayor have been elected on their promise to build the Scarborough subway, and even the Right Honourable Stephen Harper (the Prime Minister of Canada) has pledged support for the Scarborough subway. So, to all those people still discussing LRTs and shuttle buses and BRTs for Scarborough, come to reality and stop being so delusional. The Scarborough subway has already been approved by all 3 levels of government and it is inevitable that it will be the next subway project in the GTA (DRL will no longer be needed with SmartTrack and RER). It is high time that the subway finally come into Scarborough. Steve: The discussion about buses is only related to a temporary replacement of the SRT, not as a permanent operation. On that point you are distorting the discussion. As for ST and the DRL, no, ST will not replace the need for the DRL, only buy time. One big problem with RER generally is that the level of service planned for it is considerably lower than what was originally discussed in The Big Move. As for a “nominal tax increase”, I would be happy for Toronto as a whole to be so transit-friendly as to regard 1.5% as a “nominal” increase and approve more of them to undo some of the damage of the Ford years including the ability to provide better bus service throughout Toronto, including Scarborough. Most of Scarborough will not be in walking distance of the subway stations and will depend on buses both for travel to the subway and for travel within Scarborough. That service needs to be improved now, not sometime in the 2020s when the subway finally opens. I would believe all of that “support” from politicians at all levels if they demonstrated more care for transit overall, than for one or two lines that won’t open until two election cycles in the future. It’s easy to promise something for the future, much harder to deliver today. Finally, you make a huge assumption that the pro-LRT folks on this site are all downtowners. They are not, just as all subway supporters don’t live in Scarborough. It’s easy to dismiss “the other” side of a debate by saying “you don’t live here and have no right to comment”, harder to engage on issues for the city as a whole. The SBAHN’s in Germany seem to work, big time. SBAHNs’ are above the UBahns’s. And then there are the ICE trains. Oh by the way they do use buses where you can pay cash. In Japan it is similar but more complicated. In Tokyo there a JP Rail line labelled the Yamamote Line. Surface in a circle. 35 km, 33 stations. It runs like a subway line. If you go to Tokyo you will tend to ride the Yamamote line. Steve: The fact that there are surface railways that provide subway-like service and capacity all over the world is no surprise. The issue for the GTA is what exactly will we see with RER and how, if at all, will SmartTrack add to it. I have no problem with the RER scheme, only that Metrolinx and Queen’s Park don’t seem to plan anywhere as much service on it as the original scheme in The Big Move claimed for “express rail”. Meanwhile, SmartTrack seems to be little more than the addition of some local stations, of dubious value given the service level and likely loading patters on trains, plus an unworkable branch on Eglinton West. It is particularly amusing that there is a recent interest in surface rail, provided that it is implemented on the railway corridors. This is a similar argument to the one for LRT over subways — stay on the surface if possible — and using a technology, electric trains, that until recently Queen’s Park refused to acknowledge as a viable option. Unfortunately, the rail corridors almost all go downtown, and the ones that don’t are either not available or not necessarily conducive to adaptation for passenger service. Even with a surface LRT — the proposed SRT replacement — somehow these are evil streetcars that will destroy Scarborough. There is a serious dark narrative from many posters here who strongly appose a Scarborough Subway extension & future Scarborough transit. No matter where they are from in this City it’s time to promote building in all areas & move forward. 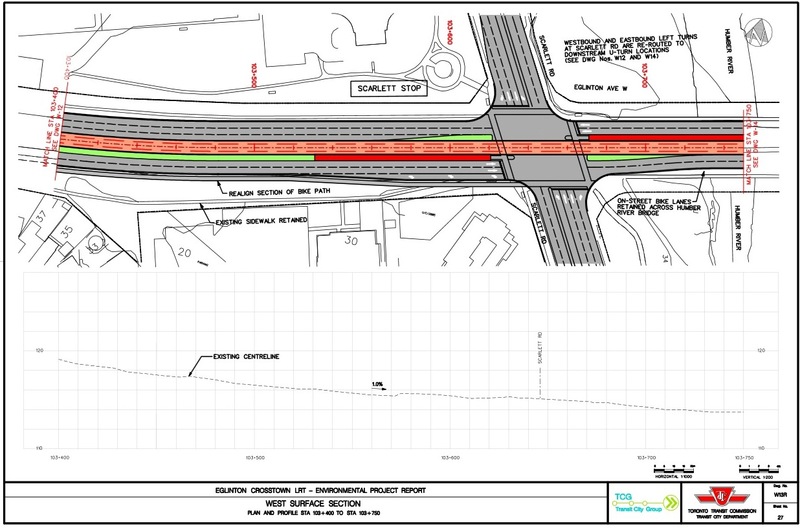 As a Scarborough resident I am excited to see this route adopted over the existing RT route and transfer. Also looking forward to many other BRT, LRT’s & RER to come over the next 25 years. At the same time I’ll be excited for the DRL, increased service levels & projects in other neglected areas of the City which are also overdue. Unfortunately there are citizens in this City who already have the infrastructure close to home that only care about their own service levels & refuse to try to care or support the City as a whole. Steve I am with you, one of the issues for the outer 416 will be frequency, and every 15 minute service will neither provide the long term capacity, nor create short enough waits to encourage use. Also Toronto, basically would require more of its rail corridors in order to make its system as extensive as would probably be ideal. However, if Stouffville, Richmond Hill and UPX can all get service on a 10 minute basis, and then signals and tracks in Lakeshore can be added, and additional (underground?) wider platforms can be added to allow service in the 5-6 minute headway range, it is hard to believe that all required core bound service could not be provided. The other thing that Toronto lacks is a real set of rapid transit connections that spread across the city. To make this work means having local rapid transit that connects to RER in as many locations as reasonably possible. So connect to RER in Richmond Hill and Stouffville with LRT. I think the Premier also needs to use her influence to make it possible to get some flexibility with regards to using the Hydro corridors where they will serve, and a proper study of how hard it would be to run BRT or LRT in Finch and Gatineau hydro corridors. Transit network design should be based on data, and reasonable forecast, not popularity, nor industrial policy. The original RT was a industrial policy/political choice that has hampered Scarborough and the rest of Toronto for decades. Toronto with its current built form needs more coverage at moderate capacity, not subway in a handful of locations. The Vaughan extension was a mistake, as would Scarborough or Yonge extensions, as they are too expensive to operate, and drain too much service from too many other areas. A transit network needs to be built to serve the city, not win elections. I do not think there are any who oppose the extension of transit in Scarborough. I think it is more an issue of what will make the biggest difference for the most people. I would oppose a subway extension at this juncture, because the honest business case is not there, and it will not buy enough transit for enough of Scarborough. I want to see that money stay in Scarborough providing transit to Scarborough, just get a lot more of the area covered. I would be quite happy to see the city & province pony up even more in terms of building the entire Sheppard & Morningside LRT, and the Scarborough LRT, with a further extension, as a proper ROW, and would love to see something in Kingston Road, preferably more than a BRT. I would note there have been posters that have suggested a King Street or Queen street subway, other than DRL or Don Mills, or even a Dundas subway, all of which I would oppose, as they do not provide for the basic needs of Toronto. I would also oppose the western side of a DRL as subway at this point as simply being not needed yet, and too expensive. Too many proposals are being done to attract votes, and not to provide quality transit. Sheppard subway, should have been done as LRT, and I think the cost of conversion should be looked at, so that a single technology can run the entire length. Where there are transfers, they need to be designed to support easy use for the most people. However, selection of route and technology needs to be based on origin-destination, network based ridership and non-political ridership growth forecasts. Building RER with a 15-10- or 6 minute headway in Stouffville will affect the rideship of both the proposed LRT and subway extension. It will also affect ridership patterns on the proposed Sheppard LRT, and bus routes. I support a drive to the lowest possible headway in Stouffville, in order to provide the best service. I support what will provide the best service to the most people, not that which will cost the most to serve the fewest. In order to convert to LRT you would need to make the tunnels deeper and this would cost a fortune. The LRT cars are almost 2 feet taller than the subway cars and there is not that much space above the subway cars in the cut and cover sections. The door to LRT has long since vanished thanks to Megalomania Mel and Mike Harris. I keep hoping that somebody will come up with some way of effectively running this without massive expense. There is also the non-trivial issue of platform height even if you managed to deal with the height of the box tunnel. 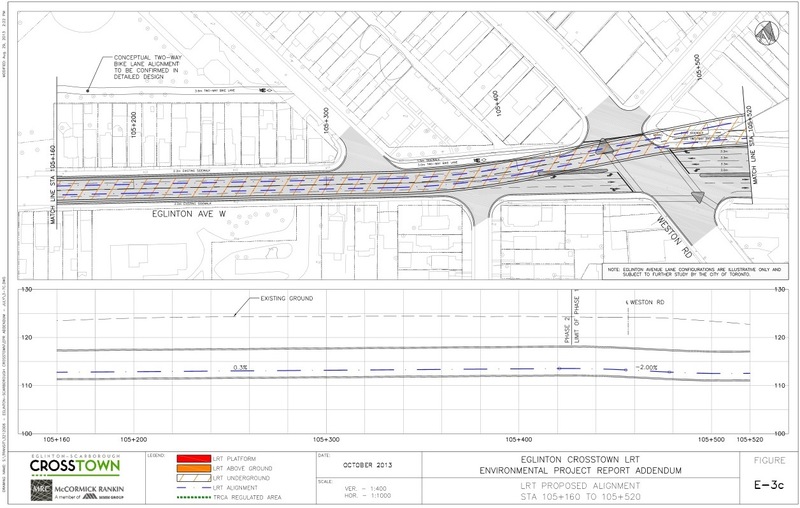 I have no problem with the idea of a short tunnel to get through the narrow area near Yonge. Why build such a high cost high capacity technology in an area with such low potential ridership? Real cities, with thinking mayors and councils, build what makes sense where it makes sense and are not obsessed with a single technology. Subway here (Sheppard), the extension to Vaughan, to Richmond Hill Centre make no sense. Better to build a line that will support the possible ridership, and provide service far enough to make a real difference. Steve: Years ago, I was speaking with Mel Lastman, then Mayor of North York, and we talked about LRT. His attitude? “Real cities don’t use streetcars.” That misrepresentation has been around for decades.